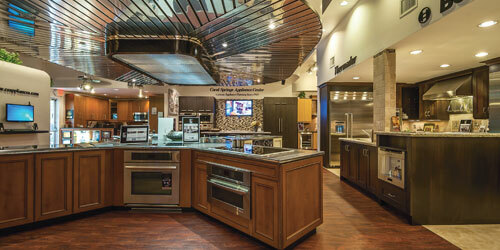 For years now – that is, 47 and counting – the folks at Coral Springs Appliance Center Inc. have built amazing kitchens for some amazing people. Want to hear some names? We’re talking Jackie Gleason, Kenny Rogers. Jeb Bush. Pierre Trudeau. Joe Namath. And that’s just skimming the list. They also cater to the everyday folk – like you and me. Be careful, though, if you swing by the center at 3500 Coral Ridge Drive; you’ll want to buy. And they recently added more showroom space, so there’s more to pine over. Viking. Jenn-Air. Bosch. Even those of us who don’t like to cook would love to cook in one of these kitchens. Coral Springs Appliance Center, 3500 Coral Ridge Drive, Coral Springs, 954-752-3880, csappliances.com.